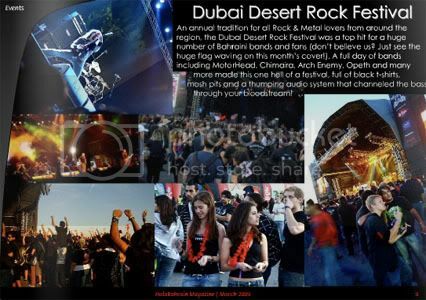 - Dubai Desert Rock: The biggest rock & festival event in the region and we were there! And as you can see from our cover picture, Bahrain was represented really well, too! 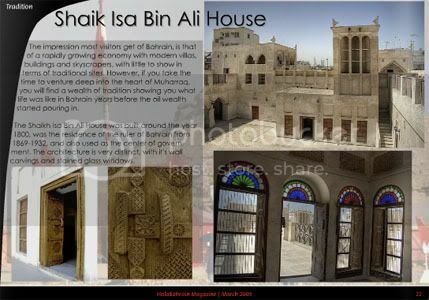 - Sh Isa Bin Ali House: Not the most well known between tourists, but one of the best places to get a great insight into what traditional building in Bahrain used to be like. A great place for those wanting to find out more about Bahrain's past! - Imran Al Aradi: We talk to the DJ/Comedian/Everything else! Making waves as a Radion Bahrain DJ, stand up comedian alongside Russell Peters and Axis of Evil, and much more, we have the exclusive interview with Imran! - Also in this issue: Photography tips by Paparazzi owner, Aziza Salman, races at the BIC, Paul Mendez live in Bahrain, local comedy night and Bahrain Fashion Week pre-launch!